Have your kids joined in on the hype for the Teenage Mutant Ninja Turtles™? I know for me it's really cool seeing them coming to the big screen again because they were something I grew up with. And to be teaming up with the Popsicle brand is just as awesome because who doesn't love a sweet and cool treat on a hot day! From backpacks to action figures, the Teenage Mutant Ninja Turtles™ have become icons in their own right — especially for kids. And now, the Original Brand Popsicle adds to the fun! With Donatello™, Michelangelo™, Raphael™ and Leonardo™ back in theaters on June 3 —Popsicle is helping parents share the turtle-power nostalgia with their little superheroes. 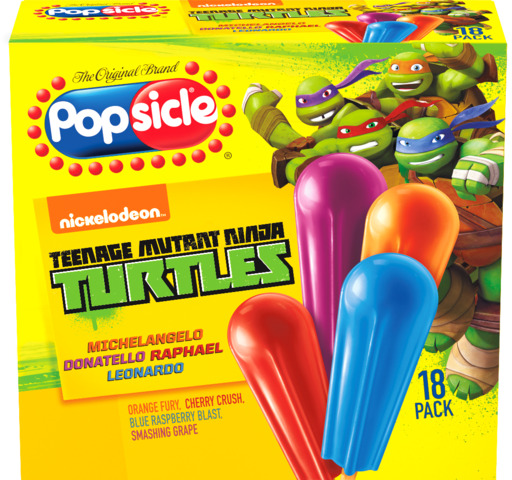 Available nationwide, the new Popsicle Teenage Mutant Ninja Turtles™ variety pack features bold, refreshing flavors like, Orange Fury, Cherry Crush, Blue Raspberry Blast and Smashing Grape. I grew up with their products. I know kids will love these! We always have Popsicles around during the summer. It's cool that the flavors match with the TMNT characters! My grandson would just love these. #1 because they are TMNT and #2 because it is a popsicle.